The Atari 1400 XL has the same characteristics as the Atari 800/600 XL machines exept for some new features: a new custom chip called "FREDDY" which replaces the old discrete semiconductors & TTL chips of the 600/800 XL to manage the memory. It has a speech synthesizer chip (Votrax SC-01) and a built-in modem (Bell 103 compatible, 300 baud). Thus it was conceived as an enhanced version of the Atari 600XL and 800XL computers and was to be software and hardware compatible with all the 8-bit Atari family systems. It seems that this computer was never marketed... All existing models are thus considered as prototypes. This system was also called by Atari A1201, Atari 1200 XLD and Atari 1200 XLT. 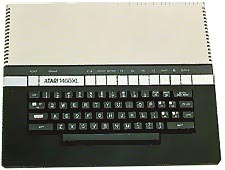 Another model was announced at the same time : the Atari 1450 XLD. see more Atari 1400 XL Ebay auctions !